“Brother” was first modeled in 1938 by Moller. 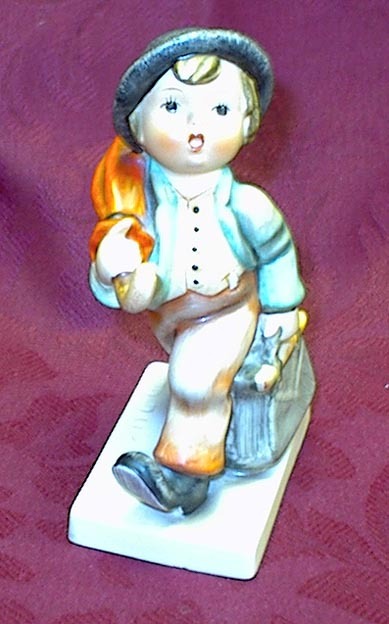 This particular figurine has 95 incised in the base and probably comes from around the early 1960’s era. It sports the “Stylized Bee” backstamp. (See Picture) This little guy has a very contented look on his face as he enjoys the world around him. His hands are pushed firmly into the pockets of his shorts. He wears hiking boots, a neckerchief, and a flower on his cap. Originally modeled by Karl Wagner (who died in 1974) in 1955 and introduced in the United States in 1962. It is stamped with the three-line mark (see photo) and has the copyright date of 1955 incised on the bottom. The “Little Pharmacist” is a little boy in a lab coat with his glasses perched on his head and a pencil behind his ear as he studies the “recipe”. Next to him is a large bottle of vitamins and he is holding a bottle of “secret ingredient” that is spilling to the ground. This Hummel has the square corner base, lop-sided bow-tie, and the original paper label on the base. This Hummel is the older style without a breast pocket and only one coat strap button and is in mint condition. 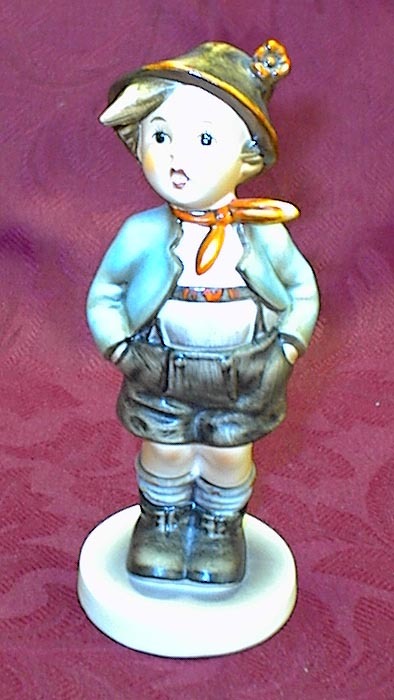 This is a classic Hummel figurine. It has the Goebel “Stylized Bee” backstamp on the bottom (used between 1960 and 1963). See Photo. 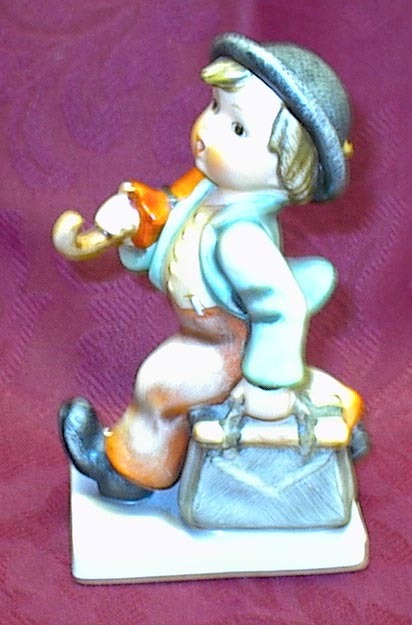 This little guy looks as though he is striding along with his umbrella over one shoulder and his carry bag in the other hand. This piece is mint with no crazing, chips or repairs and has the original paper label on the front of the base. This beautiful stein is decorated in relief with three panels showing a scene which shows 4 men and a dog at a table. The men are smoking pipes and one man has a rifle slung over one shoulder. A waitress appears to be bringing a couple of mugs of beer to the table. Above the tavern door it says: “Under Gebirgs Cchanke.” The stein is highlighted in dark blue, and plum on a background of tan. Stamped near the lip of the stein is: 3.L. 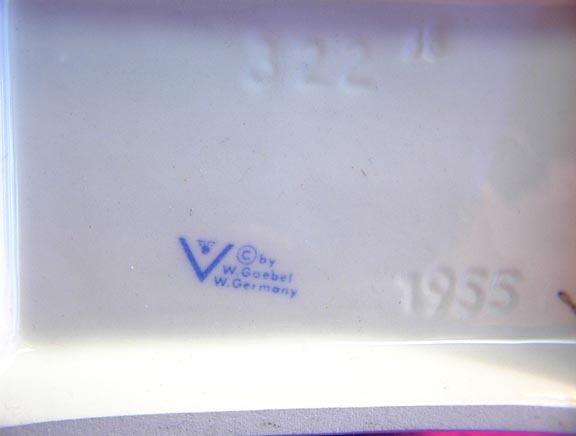 An incised stamp on the bottom of the stein reads 83/51. The stein itself is flawless with no chips, cracks or crazing. The base of the pewter lid has some damage and repair work where the round portion of the lid attaches to the thumb holder. 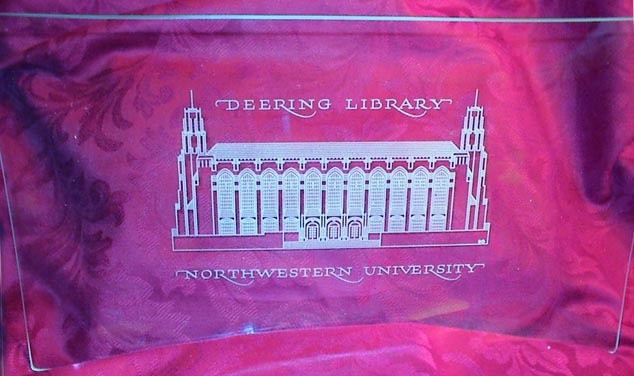 This glass tray has the likeness of NWU’s Deering Library etched on the back side. It is in excellent condition, with no chips or cracks. 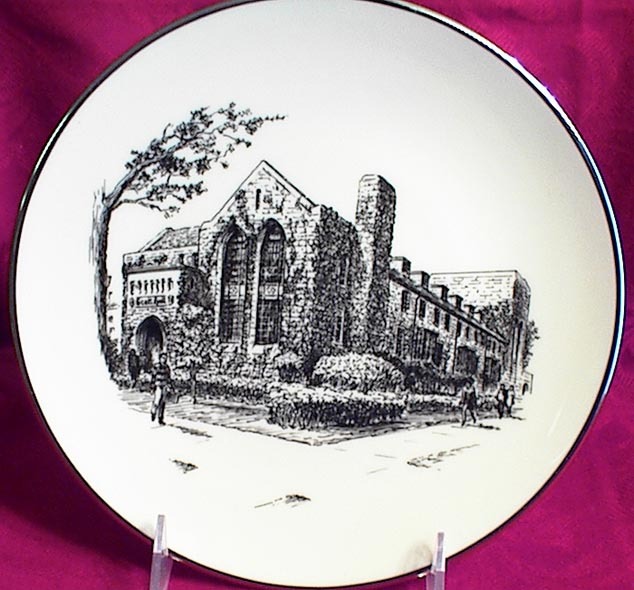 This plate features one of a series of ink sketches of Northwestern University Campus Buildings as drawn by John Heritage Wright. 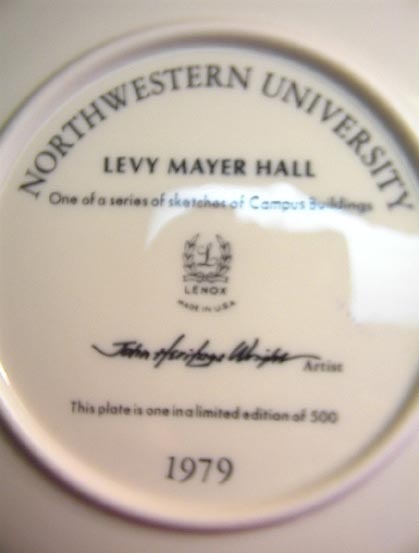 The sketch of Levy Mayer Hall is produced on an off-white plate by Lenox and has a silver trim around the edges. As stated on the bottom, it is one in a limited edition of 500 produce in 1979. This plate is in mint condition with no cracks, chips, or crazing. 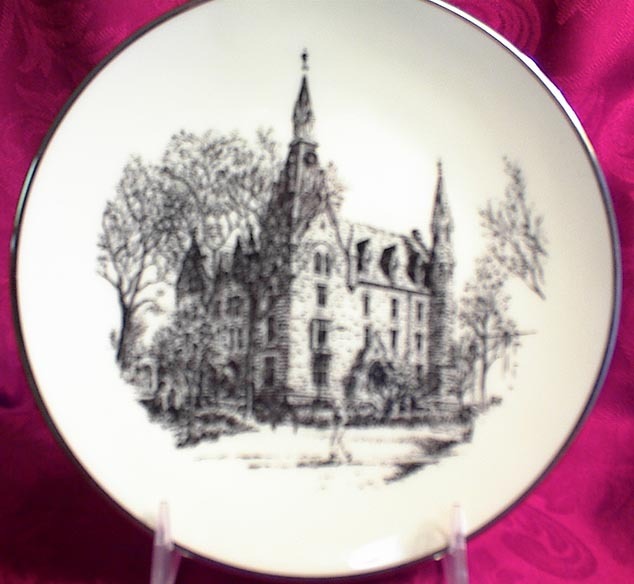 This plate features one of a series of ink sketches of Northwestern University Campus Buildings as drawn by John Heritage Wright. 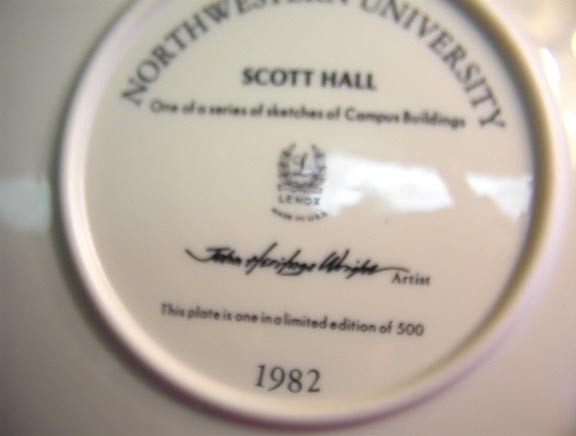 The sketch of Scott Hall is produced on an off-white plate by Lenox and has a silver trim around the edges. As stated on the bottom, it is one in a limited edition of 500 produce in 1982. This plate is in mint condition with no cracks, chips, or crazing. 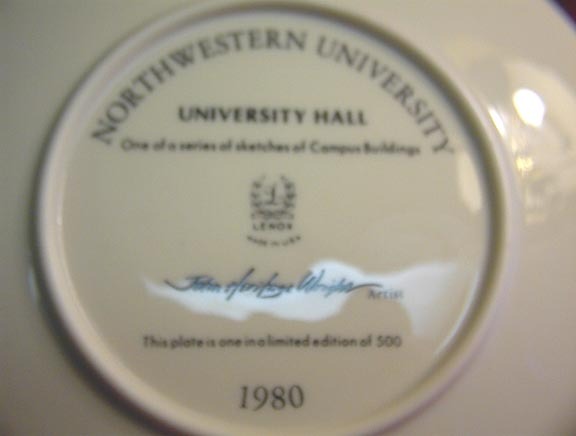 This plate features one of a series of ink sketches of Northwestern University Campus Buildings as drawn by John Heritage Wright. 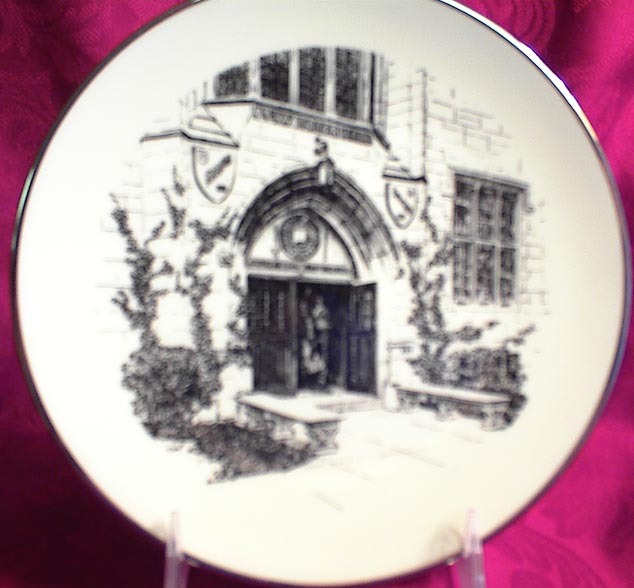 The sketch of University Hall is produced on an off-white plate by Lenox and has a silver trim around the edges. As stated on the bottom, it is one in a limited edition of 500 produce in 1980. This plate is in mint condition with no cracks, chips, or crazing. Submit your email to mary@dataman.cc to be added to the Sale Announcement email list. Please add GudStuf4Sale@estate-service.com to your email contact.